Establishing his own Derbyshire Gritstone flock has been a labour of love for Jensen Bowden, who at 13 years old is causing a stir among pedigree breeders. Chloe Palmer catches up with him at home on the Derbyshire/Cheshire border. Fitting in farming between school and working on a neighbouring farm at weekends, Jenson Bowden is passionate about his sheep. Jensen bought his first two shearlings just three years ago, but this year he has hit the big time by winning the breed champion at the Royal Welsh Show, at Bakewell and Hayfield sheepdog trials. He says: “I have been helping Stuart Wainwright at Towers Farm, Poynton, since I was nine years old and he has taught me so much about sheep. The farm have given me pointers as to how to look after my flock and offered so much useful advice. The Bowden family lives next to Lyme Park on the Derbyshire and Cheshire border, a green oasis to the south west of the Stockport and Manchester conurbation. They have 0.4 hectares (one acre) of their own land and rent additional fields nearby. Although Jensen’s father Jason worked on farms as a teenager, Jensen has not had the head start of a farming background which many farmer’s sons and daughters are blessed with. Jensen’s mother Zoe is a riding instructor and has competed successfully in showing and eventing, and his sister Zara is similarly following in her footsteps. But Jensen’s first love has always been farming. Jensen’s first foray in the showring was at Poynton Show in 2014 and he admits it was not very successful. “We took our only two shearling ewes to Poynton and decided to wash them first, but when they would not dry in time, Mum decided we should rub chalk into their fleeces like she does when she is showing ponies with white socks. The first success came in the following year when Jensen took his first home-bred tup lamb, called Arthur after his grandfather, to Hope Show. He entered Arthur in the tup lamb class and the wool class, which he duly won. 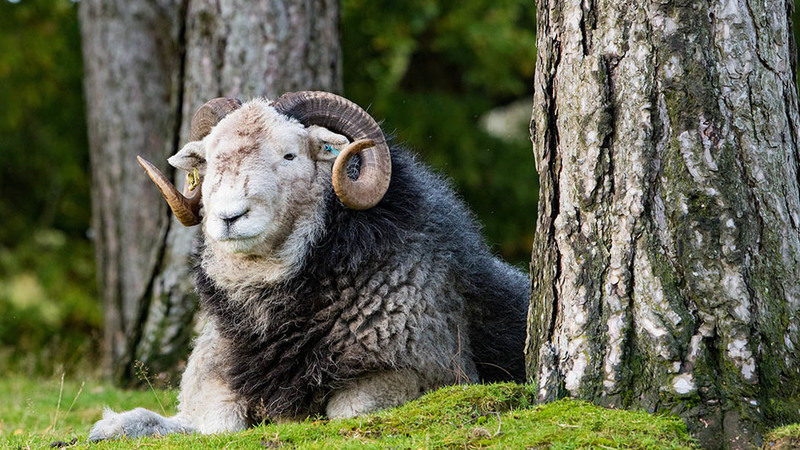 Jensen has also bought several Herdwicks and a Hampshire Down and, although he has had some success in the showring with these, particularly with his Herdwick tup Bert, it is the Derbyshire Gritstone breed which he now focuses on. This year has proved to be a good one for Jensen. His first home-bred Gritstone tup Arthur sired another tup lamb, named Geronimo, and he made his debut in the showring this year. Jensen’s run of success started at the Royal Welsh, where he won breed champion with Geronimo, then another of Arthur’s progeny, this time a ewe lamb, secured reserve female. Next stop was Bakewell Show, and despite the appalling weather, Arthur made a return to the showring and won the breed’s supreme championship and Geronimo secured reserve. For Jensen, his local show, Hope, is the one to win, as it hosts the Champion of Champion class for the Derbyshire Gritstone, but this year he had to settle for second place in this class. Despite his young years, Jensen already has a good idea of what he wants to see in his Gritstones: “They must have no black in their fleece and can only have black on their face and legs. I like white and black markings on their faces and legs, but not too much of either. It is really important the markings on their legs are well matched and symmetrical. “I like my sheep to have plenty of bone and a strong chest. I want to see a good head, but not too big, and they must have white below the ears on the back of the head. The Derbyshire Gritstone is one of the oldest native sheep breeds in Britain. It originates from, and is bred to be, adaptable in the difficult and rigorous environment of the wild rugged High Peak country. The Derbyshire Gritstone has a capacity to thrive and produce lively lambs with a relatively rapid growth rate and high survival traits. Ewes are renowned for their highly developed maternal attributes and milkiness. Hardy and robust, the Derbyshire Gritstone is polled in both sexes and is a big, flat-boned, strong sheep. It is compact, with strong placed shoulders on a well-balanced frame, with clean-cut black and white marked face and legs which are clear of wool. The body is well-woolled and the fleece is uniform and dense, of good colour, weather resistant, and clean in the skirts. It clips with a definite staple formation of medium length of 52-56s quality count, suitable for the manufacture of high-class knitwear. Jensen is already looking ahead to tupping this autumn and his next crop of lambs. Jensen drives the family tractor and manages to fit in all his jobs after school and at weekends. Where possible, lambing is planned to coincide with Easter holidays. Ewes are brought into the shed a couple of weeks prior to lambing to enable the Bowden family to monitor them closely. Beyond his showing career, Jensen is in no doubt about his future. His parents are delighted he is so passionate about his hobby and are supportive of him choosing agriculture as his future career.